The United Emirates have made a name for themselves in the last 12 months under the new leadership under Board Member – Executive Director Tariq Mohamed Al Mehairi.and Board Member – Head of the Activities Department Fahad Khalfan Al Abdooli. The grass root development and the cooperation with the WMC and IFMA and important structured events and championships have created a new era of athletes. 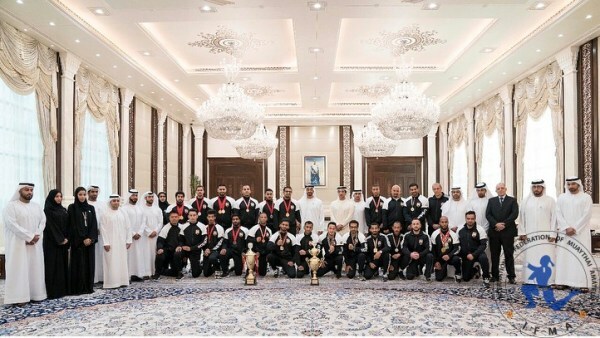 The UAE team traveled as total outsiders to the IFMA World Championships and came back with gold, silver and gold medals, and they also against all odds brought back medals from the Youth World Championships. The Crown Prince of Abu Dhabi H.H Sheikh Mohammed bin Zayed Al-Nahyan and Deputy Prime Minister and Minister of Presidential Affairs H.H Sheikh Mansour bin Zayed Al Nahyan invited the athletes to the palace thanked them on behalf of the nation and encouraged many to work for excellence in sport and life. UAE will continue to develop the sport of Muaythai and maybe soon we will see a major international event in Abu Dabi. This entry was posted on Thursday, September 13th, 2018 at 5:45 PM	and is filed under News.